The Dassault Mirage 2000N is a variant of the Mirage 2000 designed for nuclear strike. It forms the core of the French air-based tactical nuclear deterrent. The Mirage 2000D is its conventional attack counterpart. The Mirage 2000N was designed to French requirements for an aircraft to replace the older Mirage IVP. Dassault received a contract to build two prototypes. The aircraft first flew on February 3, 1986. Seventy four were built up to 1993. The Mirage 2000N is based on the Mirage 2000B two-seat trainer, but features considerable changes. The airframe was strengthened for low-level flight and fitted with an Antilope 5 radar, which is used for terrain following, navigation and ground mapping, and which can follow terrain at 691 mph (1,112 km/h). Other avionic features are twin INS's and moving map displays for both the pilot and weapon systems officer. The Mirage 2000N can carry one ASMP medium-range nuclear missile, and can also carry two MATRA Magic AAM's for self defence. Other protection features include the Sabre jamming system and the Spirale chaff system. Because the extra seat decreases range, a pair of drop tanks are carried. The first batch of 30 aircraft for the French Air Force had a sole nuclear capability, and these were designated Mirage 2000N-K1. These did not have the Spirale chaff system, and carried a pair of AN.52 free-fall nuclear bombs before the ASMP was ready. 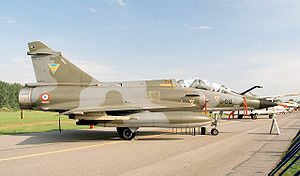 The later batch of 44 aircraft were designated Mirage 2000N-K2. These had both a nuclear and conventional capability, and a full defensive fit. The K1 aircraft now have a limited conventional attack capability. Dassault has also developed the Mirage 2000D, which is a development of the Mirage 2000N designed for long-range precision strikes with conventional weapons. This aircraft is exactly the same as the Mirage 2000N, but introduces support for conventional attack missiles such as the Apache and Scalp missiles, as well as the AASM weapons. The first aircraft, converted from the Mirage 2000N prototype, flew on the 19th February 1991, and the French Air Force ordered a total of 86 aircraft. The Mirage 2000N is not licensed for export. The French Air Force has 62 in its inventory. Like the Mirage 2000N, the Mirage 2000D had variants. The Mirage 2000D-R1 does not have the full weapons capability of the Mirage 2000D-R2, which features the Apache and Scalp missiles, the ATLIS II laser designation system, and the Samir self-protection fit. The Mirage 2000N is the nuclear strike variant which was intended to carry the Aerospatiale Air-Sol Moyenne Portee (ASMP) nuclear stand-off missile. Initial flight tests of two prototypes began on February 3, 1983, and the Mirage 2000N entered operational service in 1988. A total of 75 were built. The fighter had strengthened wings for low-altitude operations, as well as low-level precision navigation/attack systems, built around the Dassault/Thales Antilope 5 radar, which was designed for the strike role and featured a terrain-avoidance capability. The ASMP missile is 5.38 meters long with a kerosene-powered ramjet that allows it to cruise at Mach 3 to a maximum range of 100 km carrying a nuclear warhead with a yield of 300 kT. The existing kit was enhanced to provide an electronic intelligence (ELINT) capability, allowing the aircraft to record data on adversary emitters for post-flight intelligence analysis. A SAT Samir "Detecteur de Depart Missile (DDM)" missile-warning system was also added, being attached to the back of the Magic AAM pylons. Future upgrades include the addition of a Pod Reco NG (Pod de Reconnaissance Nouvelle Generation) to provide digital reconnaissance capabilities, with both day and night imagers, a digital data recorder system, and a datalink to provide real-time relay of imagery to battlefield commanders. It is being developed by Thales for service introduction in 2006. Aircraft with the updated countermeasures system and capable of carrying both the ASMP-A missile and the Pod Reco NG will be redesignated "Mirage 2000N-K3". French Mirage 2000s were prominent participants in UN and NATO air operations over the former Yugoslavia, with one aircraft shot down over Bosnia by a MANPADS heat-seeking 9K38 Igla missile fired by air defence units of Army of Republika Srpska during operation Deliberate Force in 1995, prompting efforts to obtain improved defensive systems. AdA Mirage 2000Ds served in the intervention in Afghanistan in 2001-2002, operating in close conjunction with international forces and performing precision attacks with LGBs. The French Air Force deployed the Mirage 2000D to Manas Air Base in Kyrgyzstan from 2002 to 2004 to support coalition forces in Afghanistan. Then from 2004 to 2007, they stayed at Dushanbe, Tajikistan. In summer 2007, after the Rafale fighters have been removed from the theater of operations, 3 French Mirage 2000's were deployed to Afghanistan in support of NATO troops. To shorten the response time to support NATO ISAF troops in southern Afghanistan, the aircraft moved to Kandahar International Airport. Three Rafale F2 and three Mirage 2000Ds operate from Kandahar in 2008. Dassault Mirage 2000N/2000D Pictures and Dassault Mirage 2000N/2000D for Sale.